Candelaria, groundhog day in the United States, is celebrated the 40th day after Christ’s birth, the day Jesus was presented in the temple. 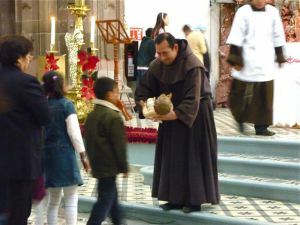 Baby dolls of Jesus, called Santo Ninos, are taken to the church to be blesses and kissed by the priest. Every family has at least one, and there are hundreds of handmade outfits available to dress your baby Jesus in. The first year the doll is presented he is dressed in white. A colored outfit for the second year. On the third year Jesus is dressed as King of the World, complete with a crown and throne ready to provide miracles. In Pre-Hispanic San Miguel this was the time for rituals to bring rain and plentiful crops. By the 17th century indigenous communities brought seeds and bulbs to the churches for special blessings bringing a good harvest and the rains of April and May (now normally dry months). Today in Parque Jaurez the annual spring flower and garden show begins the same day for six decades. Through out the month dozens of vendors line the walkways of the park, selling everything imaginable for the garden while there is music, food and dancing among the breathtaking flowering plants. 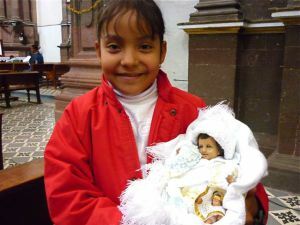 If, on Three King’s Day, you received the hidden baby in the special bread, you host the Candelaria party featuring a mix of indigenous and Catholic beliefs with atole (a corn drink) and tamales. The indigenous Mayans and Aztecs believed corn was a the basis of life. Tamales are served in corn leaves representing the baby Jesus in his blankets. The candles used on Cadelaria (hence, the name) signify dismissing the cold, awakening the earth and casting out flooding and earthquakes. They are also blessed today then lit to guide lost souls to heaven, part of the traditions started in honor of Tlaloc, the indigenous’ God of Rain, that were held this same day.